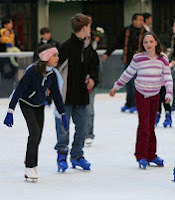 For the 16th year, the City of Reno has hosted an ice skating rink. The current venue is called “Rink on the River”, because it resides next to the Truckee River on the corner of First and Virginia Street. The cost for adults is $7.50, youth and seniors are $5.50. Skate rentals are $2.50. You can also buy punch cards and season passes. For more information visit the City of Reno website. City staff say the ice rink clears a profit each year. Last season was particularly good because people were looking for a winter-time activity due to the poor ski season.